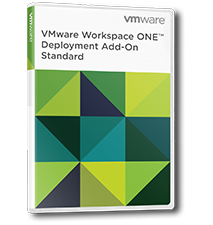 The Workspace ONE Deployment Add-on - Standard can be purchased for the services listed in the datasheet. Please also review the appendix section in the datasheet for details on each Add-On service, if a you need more than one of the Standard Add-Ons, multiple of this SKU will need to be purchased. Review the datasheet for a detailed description of the service offering. The Workspace ONE Deployment Add-on - Advanced can be purchased for the services listed in the datasheet. Please also review the appendix section in the datasheet for details on each Add-On service, if a you need more than one of the Advanced Add-Ons, multiple of this SKU will need to be purchased. The Workspace ONE Deployment Add-on - Professional can be purchased for the services listed in the datasheet. Please also review the appendix section in the datasheet for details on each Add-On service, if a you need more than one of the Professional Add-Ons, multiple of this SKU will need to be purchased.